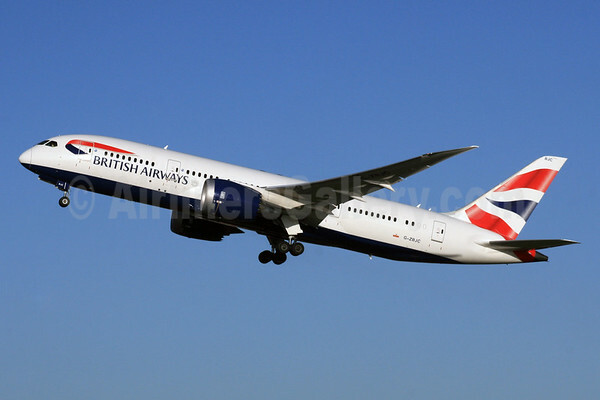 British Airways (London) has 22 216-seat Boeing 787-9 Dreamliners on order. Yesterday (September 7), the first copy, the pictured 787-9 G-ZBKA (msn 38616), successfully completed its first flight from Paine Field near Everett via Moses Lake. The new type will be introduced on the daily London (Heathrow) (LHR) – Delhi route on October 25. The London (Heathrow) – Abu Dhabi – Muscat route will follow on November 5 per Airline Route. The 787-9 will also be introduced from LHR to Kuala Lumpur on December 5 and Austin, Texas on February 1, 2016. Copyright Photo: Steve Bailey/AirlinersGallery.com. Boeing 787-9 Dreamliner G-ZBKA arrives back at Paine Field after its successful first flight on September 7. This entry was posted in British Airways and tagged 38616, 787, 787-9, 787-9 Dreamliner, Abu Dhabi, Boeing, Boeing 787, Boeing 787-9, Boeing 787-9 Dreamliner, British Airways, Delhi, Everett, G-ZBKA, Heathrow, London, Muscat, PAE, Paine Field on September 8, 2015 by Bruce Drum. 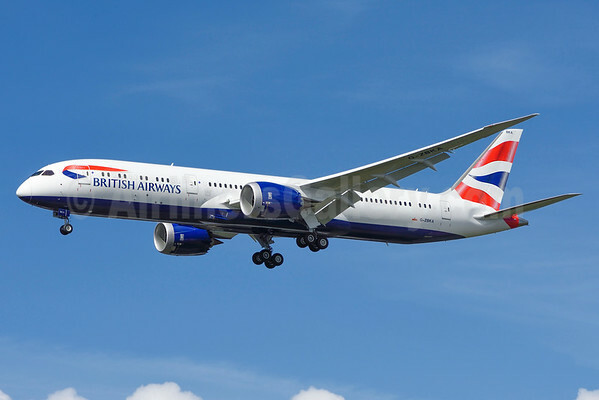 British Airways (London) will resume daily Boeing 787-8 Dreamliner service on the London (Heathrow) – Calgary route now on December 5, 2015 per Airline Route. The Boeing 767-300 will be assigned to the route from October 25 until December 4. In other news, BA has announced the new Boeing 787-9 Dreamliner will be assigned to the London (Heathrow) – Delhi route from October 25 according to Airline Route. Additionally the new type will be assigned to the London (Heathrow) – Abu Dhabi – Muscat route starting on November 17. The 787-9 will also now operate on the London (Heathrow) – Kuala Lumpur route starting December 21 and the new London (Heathrow) – Austin route starting February 22, 2016. Copyright Photo: SPA/AirlinersGallery.com. British Airways currently operates eight Boeing 787-8 Dreamliners. The first 787-9 Dreamliner will be registered as G-ZBKA (msn 38616). BA has 16 on order. Boeing 787-8 G-ZBJC (msn 38611) departs from London (Heathrow). This entry was posted in British Airways and tagged 38611, 787, 787-8, 787-8 Dreamliner, Abu Dhabi, Austin, Boeing, Boeing 787, Boeing 787-8, Boeing 787-8 Dreamliner, British Airways, Calgary, Delhi, G-ZBJC, Heathrow, Kuala Lumpur, LHR, London, Muscat on July 18, 2015 by Bruce Drum. 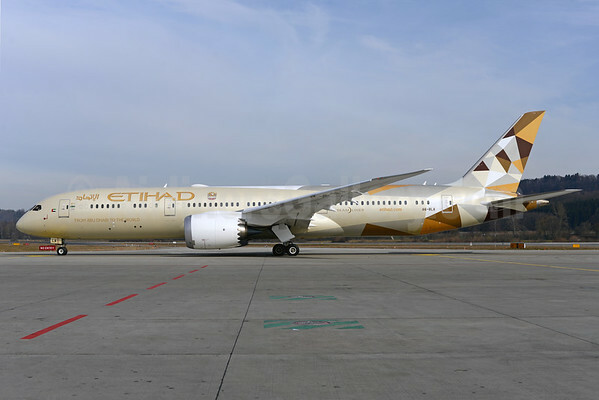 Etihad Airways (Abu Dhabi) will operate the new Boeing 787-9 Dreamliner on the daily Abu Dhabi – Zurich route from July 6. The 787 will replace existing Airbus A330-300 service. In other news, the company launched daily Abu Dhabi – Edinburgh Airbus A330-200 service on June 8. Copyright Photo: Rolf Wallner/AirlinersGallery.com. The company has brought the new type to Zurich before. Boeing 787-9 Dreamliner A6-BLA (msn 39646) taxies at Zurich. This entry was posted in Etihad Airways and tagged 39646, 787, 787-9, 787-9 Dreamliner, A6-BLA, Abu Dhabi, Boeing, Boeing 787, Boeing 787-9, Boeing 787-9 Dreamliner, Etihad Airways, ZRH, Zurich on June 10, 2015 by Bruce Drum. Etihad Airways (Abu Dhabi) today (June 2) launched daily nonstop flights between Brisbane and Abu Dhabi. Etihad Airways flight EY 484 departed the airline’s home base, Abu Dhabi, at 10 pm (2200) yesterday (June 1) and arrived in Brisbane at 5.50 pm (1750) today where it was met by a traditional water cannon salute. Return flight EY 485 will depart Brisbane for Abu Dhabi at 9.35 pm (2135) today and arrive in Abu Dhabi at 6 am local time. The new nonstop flights are operated by Etihad Airways’ brand new three-class Boeing 787-9 Dreamliner which features the airline’s ground-breaking next generation First Suite, Business Studio and Economy Smart Seat. Etihad Airways’ new Boeing 787-9 Dreamliner will carry 235 guests – eight in First Class, 28 in Business Class and 199 in Economy Class. Etihad Airways commenced three weekly flights to Brisbane via Singapore in 2007 and increased frequency to daily on February 1, 2013. In other news, Etihad Airways also launched its inaugural Abu Dhabi-Sydney Airbus A380 flight – EY454 – departed Abu Dhabi International Airport at 10 pm (2200) on May 31. 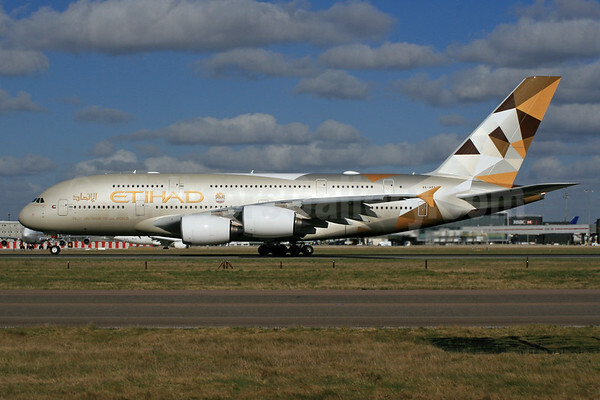 The A380 will now operate one of the airline’s two daily services between Sydney and Abu Dhabi. The airline’s additional four weekly Airbus A340-600 flights will be upgraded to a Boeing 777-300 ER aircraft. Copyright Photo: Paul Bannwarth/AirlinersGallery.com. Boeing 787-9 Dreamliner A6-BLA (msn 39646) departs from Zurich. This entry was posted in Etihad Airways and tagged 39646, 787, 787-9, 787-9 Dreamliner, A6-AFA, Abu Dhabi, Boeing, Boeing 787, Boeing 787-9, Boeing 787-9 Dreamliner, Brisbane, Etihad Airways, Sydney, ZRH, Zurich on June 2, 2015 by Bruce Drum. Venice – Abu Dhabi is set to be the first new route opened by the new Alitalia since the January 1, 2015 launch of operations, after Etihad Airways acquired a 49% stake in the company. The daily connection was presented to business leaders, media and other institutions in Venice today by Alitalia’s Chairman Luca di Montezemolo and CEO Silvano Cassano, together with Enrico Marchi, Chairman of the SAVE Group – Venice Airport, and Peter Baumgartner, Chief Commercial Officer of Etihad Airways, the strategic equity and codeshare partner of Alitalia, which has added its ‘EY’ code to the service. Alitalia will reinforce its presence in Italy’s North Eastern airports with the new route, reaching a total of 89 weekly connections from Venice (64) and Verona (25). From Venice alone, Alitalia will offer approximately 600,000 seats on direct flights during the summer season for air transportation (March-October), including those on partner airlines, to Rome, Berlin, Dusseldorf, Paris, Amsterdam, Moscow and Tirana. The new connections with Abu Dhabi will strengthen Alitalia’s intercontinental offering, allowing passengers departing from North Eastern Italy to reach not just the United Arab Emirates, but continue, thanks to Etihad Airways’ extensive global connections, to 30 destinations in the Middle East (Bahrain, Muscat, Kuwait, Dubai and Al Ain), Africa (Johannesburg, Nairobi and Khartoum), the Indian Subcontinent (Mumbai, Kochi, Delhi, Bangalore, Karachi, Lahore, Dacca, Malè, Seychelles and Colombo), Asia (Beijing, Seoul, Phuket, Chengdu, Bangkok, Ho Chi Minh City, Kuala Lumpur, Singapore and Jakarta) and Australia (Melbourne, Sydney and Perth). The Venice-Abu Dhabi flight will take off on March 29, 2015. Simultaneously, Alitalia will also launch a new flight from Milan Malpensa Airport to the capital of the United Arab Emirates, tripling the number of its flights for Abu Dhabi, which will reach a total of 42 weekly flights. From Venice’s Marco Polo airport, the first Alitalia flight for Abu Dhabi will take off this Sunday, March 29, at 9:55 pm, landing in Abu Dhabi at 5:55 am (local time) on the following day. Flights from Abu Dhabi to Venice will depart at 9:05 am (local time) to arrive at the Marco Polo Airport at 1:35 pm. The service will be operated using a 250-seat Airbus A330 aircraft, arranged in three service classes: Magnifica (business class), Classica Plus (premium economy) and Classica (economy). Copyright Photo: Fred Freketic/AirlinersGallery.com. 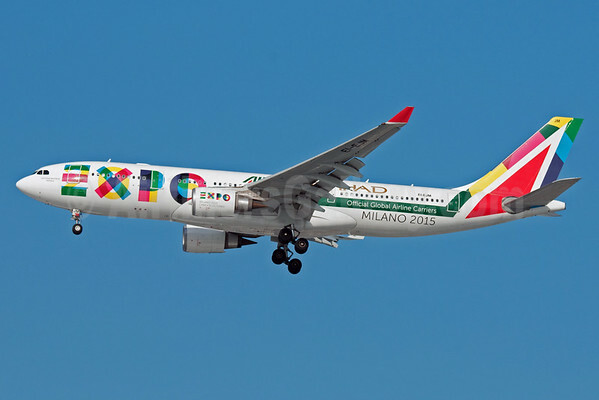 Airbus A330-202 EI-EJM (msn 1308) in the promotional Expo Milano 2015 special livery approaches the runway at JFK International Airport in New York. This entry was posted in Alitalia (3rd) and tagged 1308, A330, A330-200, A330-202, Abu Dhabi, Airbus, Airbus A330, Airbus A330-200, alitalia, Alitalia (3rd), EI-EJM, Etihad Airways, Expo Milano 2015, JFK, New York, SAVE Group – Venice Airport, Venice on March 25, 2015 by Bruce Drum. Almost 14.8 million passengers flew with Etihad Airways last year, a significant increase of 23 percent over 2013 levels. The growth in passenger demand continued to outstrip the airline’s capacity increase, highlighting the strength of its long-term growth strategy. In total, Etihad Airways carried more than 74 percent of the 19.9 million passengers who travelled through Abu Dhabi International Airport in 2014. With the addition of the airline’s equity partners that operate flights into the UAE capital, the combined total rises to a significant 82 per cent of passenger traffic at Abu Dhabi International Airport. 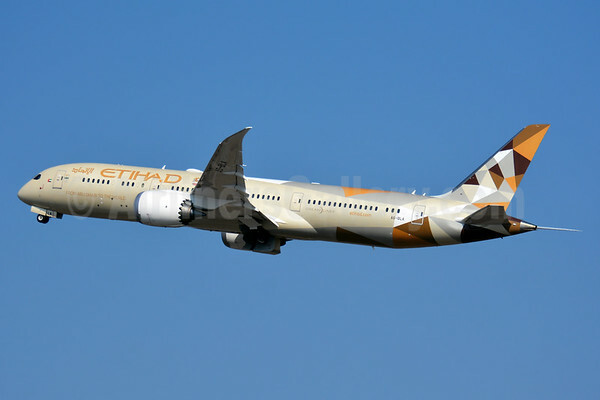 Etihad Airways introduced 10 additional destinations to its global route network in 2014, with new services launched to Medina, Jaipur, Los Angeles and Zurich in the first half of the year, and Perth, Rome, Yerevan, Phuket, San Francisco and Dallas/Fort Worth in the second half of the year. In addition, frequencies were increased on 23 existing routes across the world in 2014. In August 2014, the airline announced a €560 million investment in the new Alitalia to acquire a 49 percent shareholding in the carrier, a 75 per cent interest in Alitalia Loyalty, which operates the MilleMiglia frequent flier program, and five pairs of slots at London’s Heathrow Airport, which will be leased back to Alitalia. The transaction received European Commission merger clearance in November 2014 and became effective on 31 December 2014. Etihad Airways also reported strong cargo growth for 2014, with 568,648 tons of freight and mail flown in total, a 17 per cent increase year-on-year. The airline accounted for 89.6 per cent of cargo imports, exports and transfers at Abu Dhabi airport last year. An additional nine Airbus aircraft (two A330-200s, three A321s, three A320s and one A330-200F) and six Boeing aircraft (one 777-300 ER, five 777-200 LRs) were received in 2014, while further leased capacity was also added to enhance the airline’s rapid growth. Copyright Photo: Jacques Guillem Collection/AirlinersGallery.com. Airbus A319-132 A6-EID (msn 1947) now sports the old 2003 livery. 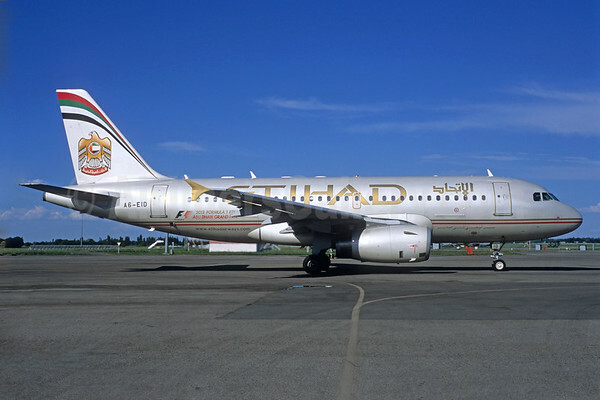 This entry was posted in Etihad Airways and tagged 1947, A319, A319-100, A319-132, A6-EID, Abu Dhabi, Airbus, Airbus A319, Airbus A319-100, Etihad Airways on February 2, 2015 by Bruce Drum.